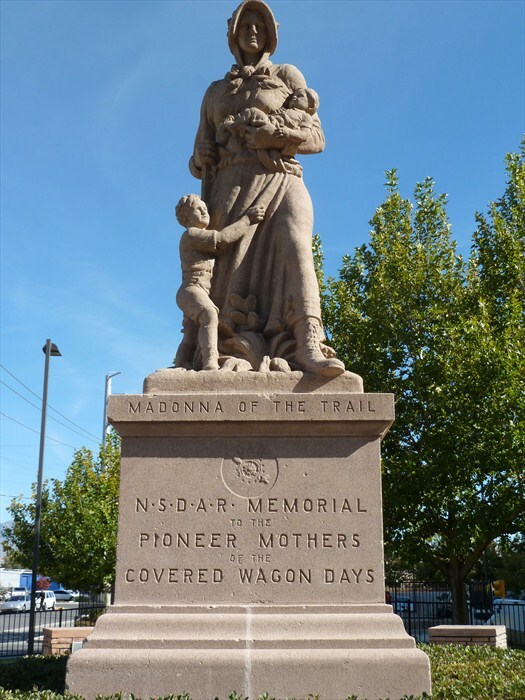 "Madonna of the Trail is a series of 12 monuments dedicated to the spirit of pioneer women in the United States. The monuments were commissioned by the National Society of Daughters of the American Revolution (NSDAR). They were installed in each of the 12 states along the National Old Trails Road (Route 40), which extended from Bethesda, Maryland, to Upland, California. Acknowledgements: The New Mexico State Organization National Society Daughters of the American Revolution owns and maintains this Madonna of the Trails landmark. This marker was originally commissioned by the National Society Daughters of the American Revolution. It is currently funded by the California State Society Daughters of the American Revolution.